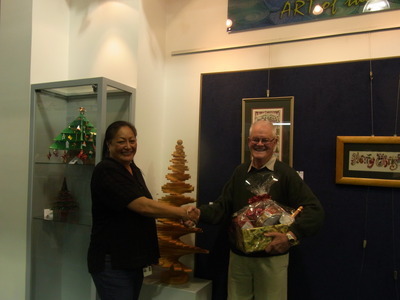 "Win a Christmas Hamper" from the Library Newsletter, November 2012. "We're looking for the best Christmas decoration to win a lovely hamper full of Christmas goodies. Your decoration can be made of anything - paper, card, cloth wood etc. and can be for the table, to hang from the tree, above the door or wherever. The competition opens November 20th and we will accept decorations up to December 20th, when they will be judged by our own Mayoress Sue Winters."